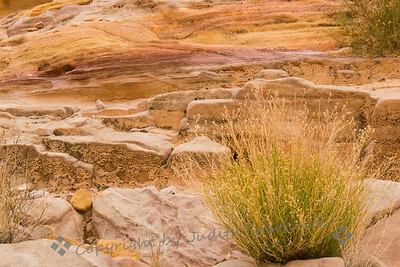 A few days camping and photographing the beauty of the Valley of Fire, Nevada. 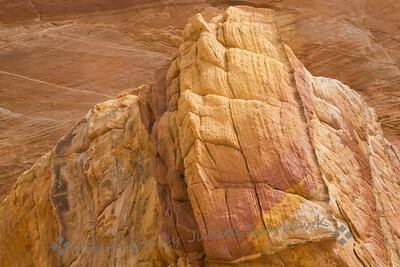 ~ This amazingly colored sandstone was observed in the Rainbow Vista area of the Valley of Fire in Nevada. The area was filled with striated colors, eroded holes, arches, and other interesting geological features. 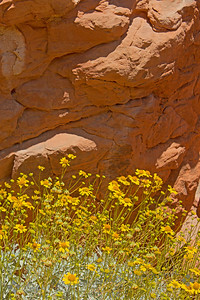 Brittle Brush ~ This common desert plant and flower, Brittle Brush, looked especially pretty with their bright yellow flowers against the red sandstone rocks. Valley of Fire, Nevada. 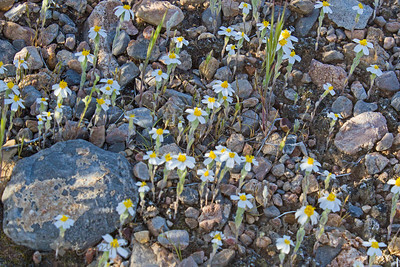 Belly Flowers ~ These tiny desert flowers were only about 1 inch tall, otherwise called "belly flowers" as you practically have to be down on your belly to photograph them. They were growing en masse, right out of the rocky soil. Valley of Fire, Nevada. 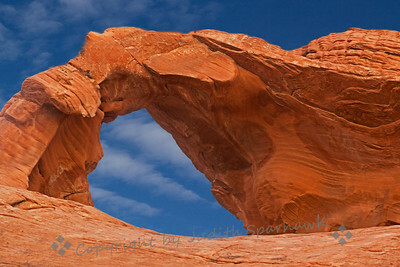 Arch Rock ~ One of the most well-known formations in Valley of Fire is Arch Rock, near the Arch Rock Campground where I camped. I stopped by this site a few times to shoot it in different types of light. Cave in the Pink Rock ~ This formation shows the varied colors of sandstone, from pink to gold, in Valley of Fire in Nevada. The rocks were full of holes and arches, and were very beautiful. 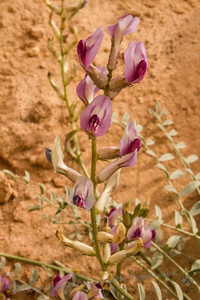 Wildflower of Spring ~ This wildflower was growing out of the sand in the desert in Valley of Fire in Nevada. 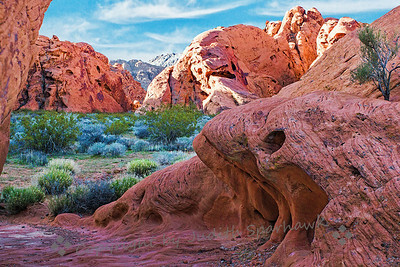 Desert Scene ~ This sandstone formation was photographed in Valley of Fire in Nevada. 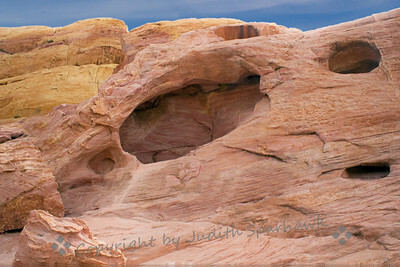 Rock of Pink and Gold ~ A sandstone formation photographed in Valley of Fire in Nevada. 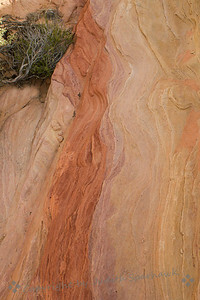 ~ This isn't a waterfall at all, of course, but the the "stream" of colored strations in the sandstone made me think of water flowing down a cliffside. Valley of Fire in Nevada. ~ Called "the cabins", these stone structures were build in the 1930s by the Civilian Conservation Corps. They were intended as overnight shelter for travelers, and had a fireplace in each room. 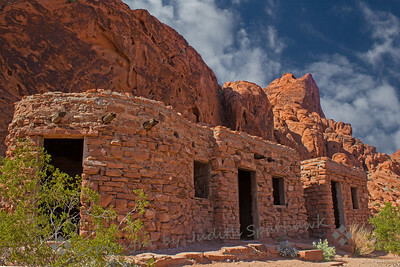 No longer in use, they are a destination in the Valley of Fire, and are adjacent to a picnic area. 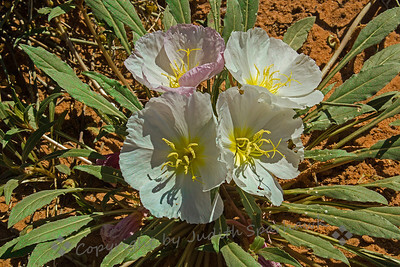 Desert Wildflowers ~ Springtime in the desert, with wildflowers in bloom. Thanks Rick; this is Evening Primrose. Holes in the red rock formations in Valley of Fire in Nevada. 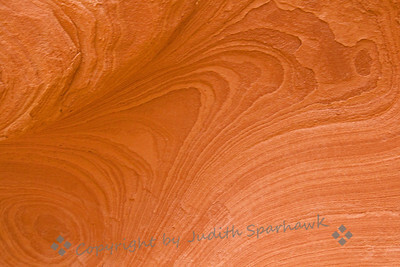 Wind and rain sculpt these sandstone rocks. Rainbow Rocks ~ This sandstone formation shows the beautiful colors, from pink to gold to red, in Valley of Fire in Nevada. Into the Slot Canyon ~ This trail leads into a slot canyon or "the narrows" along the White Domes trail in Valley of Fire in Nevada. 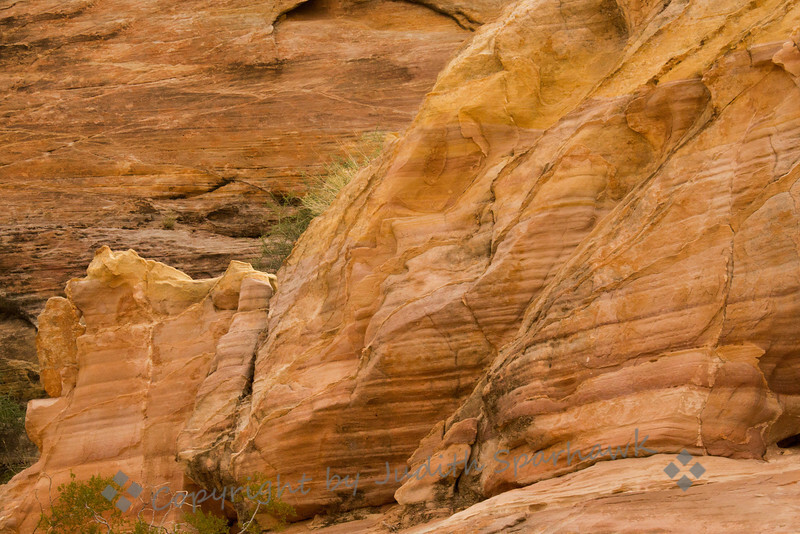 I liked the striations of the rocks, and enjoyed walking through the canyon. 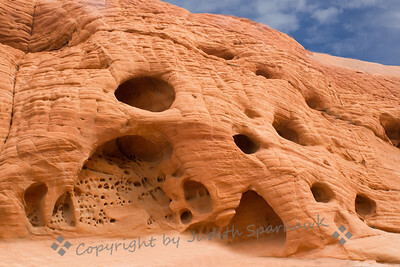 Sandstone with Holes ~ One of the many geological formations in Valley of Fire in Nevada. 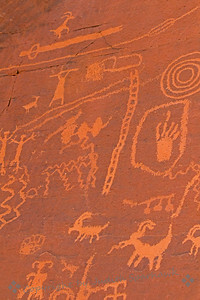 Petroglyphs on Atlatl Rock ~ Photographed in the Valley of Fire in Nevada. There are petroglyphs in several areas of the valley. They show people, animals and other symbols of native life. 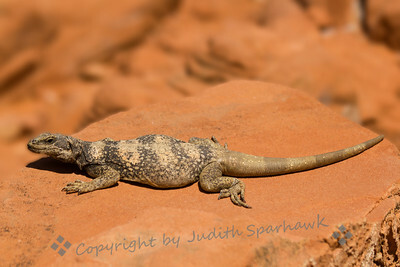 ~ This large lizard is fairly common in the Mojave Desert. 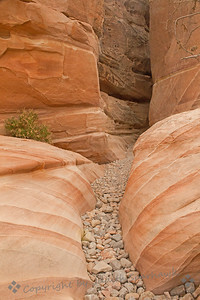 This one was about 10 inches long, and was photographed in the Valley of Fire in Nevada. His scientific name is Sauromalus Obesus. Poor guy, he can't help that he's a little chubby around his middle! 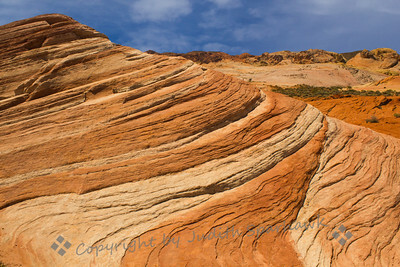 Sandstone Swirl ~ One of the many striated formations in Valley of Fire in Nevada. 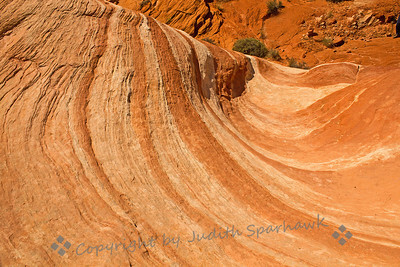 Fire Wave ~ This formation is called the Fire Wave, and is reached by hiking a circuitous route from the main road, up and down hillsides, over sandstone, through wildflowers, and over deep sandy trails. Thank heavens for the trail posts at intervals along the way, or I never would have found it! Valley of Fire, Nevada. 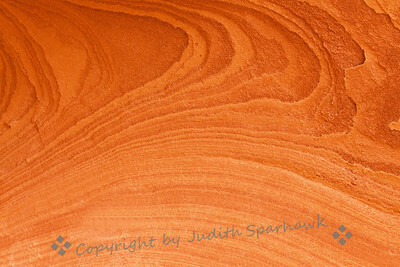 Nature's Designs ~ Patterns in the sandstone in Valley of Fire in Nevada. 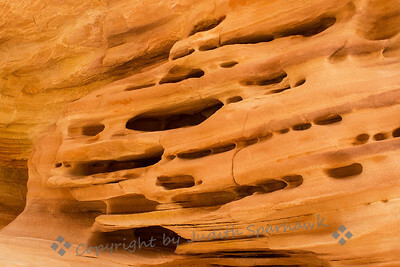 Sandstone Patterns ~ Beautiful sandstone, eroded by wind, developed interesting patterns and designs. This was photographed in Valley of Fire in Nevada. 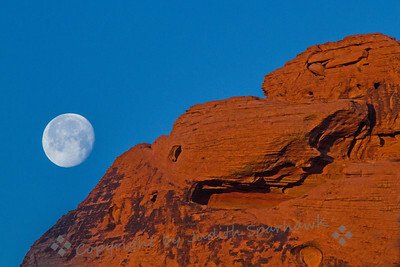 Moonset ~ This almost-full moon was setting in the early morning hours, slipping behind the red rocks of the Valley of Fire in Nevada. 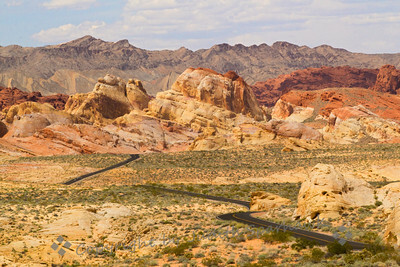 Rainbow Vista Road ~ This section of road cuts through the area of Valley of Fire called Rainbow Vista. 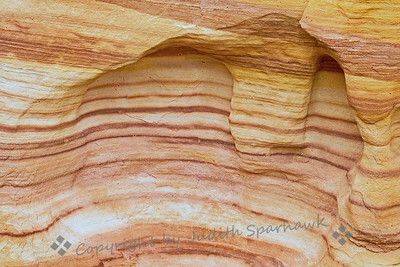 The colors of the sandstone formations were beautiful.